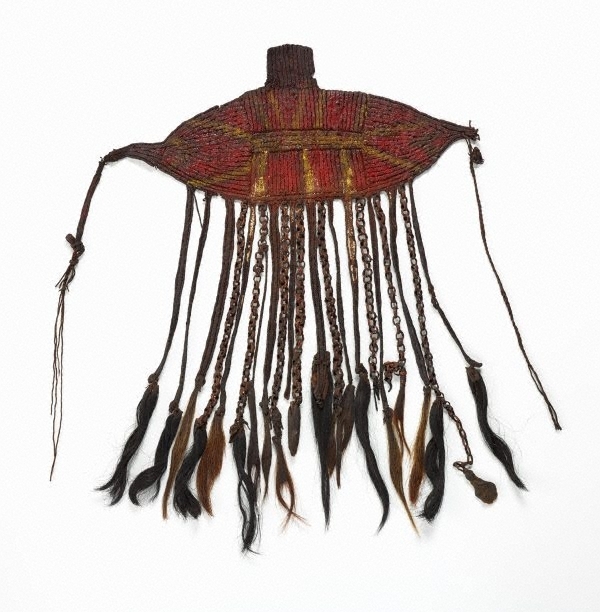 This pig-tail-fringed apron adorner was worn on special occasions to enhance a man's appearance. Although acquired in Wola territory in the southern highlands, they were more common among neighbouring Huli people. The 'kwiy aegop' was worn in front of long aprons with the side straps tucked into a bark girdle. They lasted for many years and were stored in protective leaf parcels. Tightly knitted from lengths of bast fibre, the size and shape vary from small and triangular to large and rectangular. The outer surface is coloured with 'dind hat' (red ochre) or powdered trade-store paint mixed with 'tigaso' tree oil or pig grease. The lower edge is adorned with linked chains of cane and tassels of tails from animals killed by the owner, his relatives and friends. The origin of the 'kwiy aegop' is unknown, but in the past they were highly treasured objects.